I’d like to think that God had it all planned out. You know: Get born. Chill ’till the Magi show up with Christmas presents. Dodge Herod’s little genocide. Hide out in Egypt until the coast is clear. Around Bar-Mitzvah age, start showing off at the Temple. Etc. But with Joseph and Mary throwing Him an abortive curveball like this, He’d have to improvise. And carry on. After all, He’s got a pretty important mission still on His plate: the salvation of all humankind! So to borrow a line from Fred and Ginger, He’s gotta pick Himself up, dust Himself off, and start all over again! Is it true that fetuses have tails? Or is that only Jesus’s fetus? I’m so stoked to find out how The Lord accomplishes his mission!! 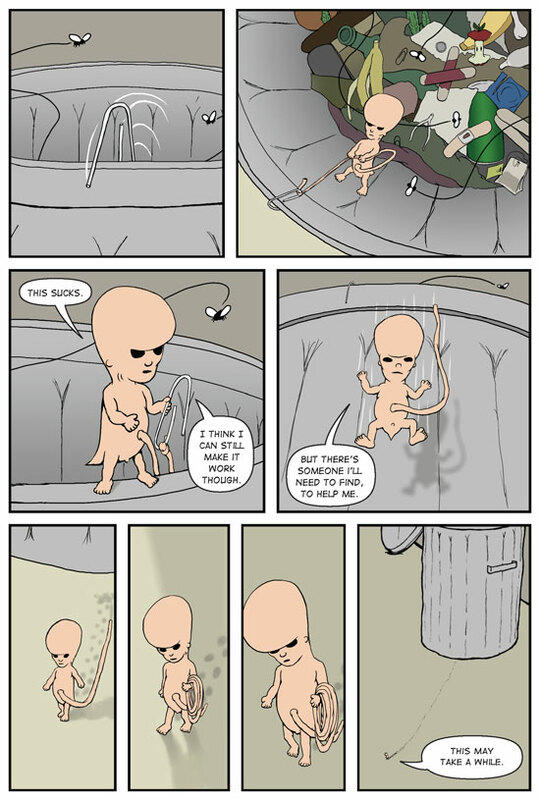 Yes, all human fetuses have tails. At this stage of development it’s actually even longer than this. But it doesn’t grow for very long, and gets overtaken by the rest of the embryo. Early fetuses also have slits that look like gills. I’m trying to be realistic here. Without grossing too many people out, that is. By the way, this technically isn’t “Jesus”. Whether you go by modern Christian or contemporary Jewish naming rituals, this fella never got one. He would have been named “Jesus” – or more accurately “Yeshua” – after He was born. But He wasn’t. Of course He’s still the Christ, so it’s OK to call Him “Fetus Christ”. Without grossing too many people out, that is. I’m sorry, but what does that have to do with Fetus Christ? Besides, I’ve already done cartoons that offended Muslims, Christians, Jews, Mormons, Scientologists, and Amway Distributors. islamophobic? Is that a word? Dang I wish I hadn’t stumbled on this site until after you finished the series. Now I’ll have to wait with baited breath for each new episode. How long is this going to take?? The story started on Christmas Eve, with new pages posted every Friday at sundown, and the last page will be posted on Easter weekend. Sorry to take so long, but I can only scribble so fast!